When it comes to creating jobs, lawmakers find themselves in a dilemma. They can improve the business climate for everyone, which encourages growth but makes it hard to claim credit for creating jobs. Or they can give tax money to select firms, which lets them take credit for a new business groundbreaking, regardless of whether the costs of the subsidies are worth it. A better business climate will actually make people’s lives better. Giving money to select interests, on the other hand, shifts money around and typically leaves people worse off. Business managers are not waiting around for politicians to tell them what to do. And that’s why most economic growth happens without lawmaker approval. Most job growth happens without lawmakers taking money from taxpayers to give to select companies. 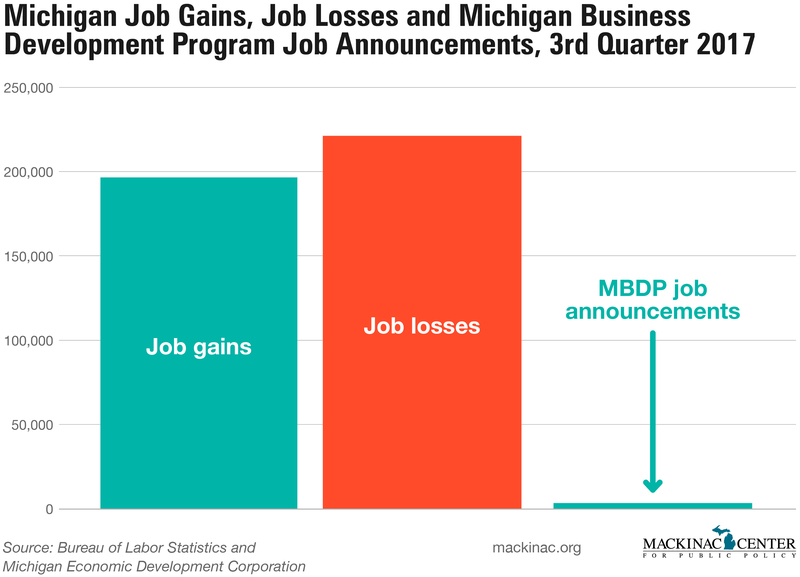 According to the Bureau of Labor Statistics, Michigan lost 221,400 jobs in the third quarter of 2017 and gained 196,700 jobs. This is only the third quarter in the current recovery that saw a net job loss. Meanwhile, state officials announced that they were going to deliver subsidies through the Michigan Business Development Program to 23 companies that pledged to create 3,700 jobs. If the state had to rely on the few businesses that receive taxpayer money to replace the jobs lost in the quarter, it would only be able to replace 1 out of 60 jobs. The business subsidy program is far less beneficial than advertised. For one thing, it’s rare for all the promised jobs to show up. Even worse, when you look at the net costs of the program, you’ll find that for every half million it spends in an average county, the county loses 600 jobs. These targeted business subsidies simply don’t work. Instead, lawmakers can find ways to operate governments more efficiently and use the savings to lower the tax burden. Or they can re-examine regulatory burdens, such as occupational licensing requirements, much of which make it harder to create jobs without protecting consumers. Both steps would encourage more job growth and less job loss. And they would be actual improvements to the business climate instead of the token symbols of growth delivered by select subsidies. At bottom, however, the question is whether select business interests have higher status among lawmakers than regular taxpayers. There are a few that get these deals and everyone else has to pay for them. If these deals were actually able to generate broad economic growth, that would be one thing. But since they fail to live up to their promises, these subsidies show just where regular people stand compared to the ones getting special deals.